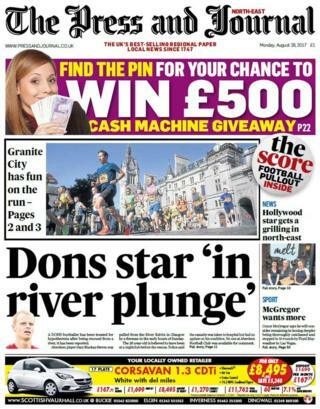 The rescue of footballer Gary Mackay-Steven from the River Kelvin features on the front pages of a series of Scotland's newspapers. 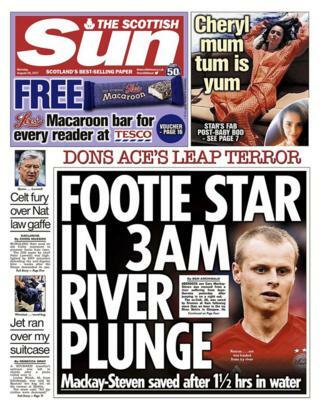 The Scottish Sun reports that the Aberdeen star was saved by firefighters at 04:00 on Sunday, after jumping into the water during a night out. He was treated for hypothermia following the incident in Glasgow's West End, according to The Press and Journal. 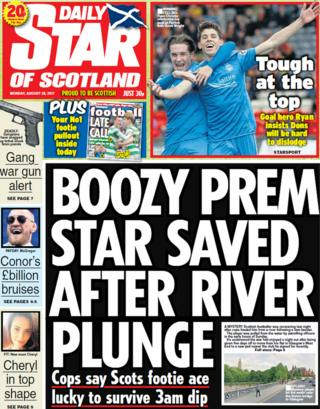 The Daily Star does not name the sportsman, but they report that police officers say he is "lucky to be alive". Brexit is the subject which dominates many of the other newspapers, as a third round of UK-EU talks get underway. 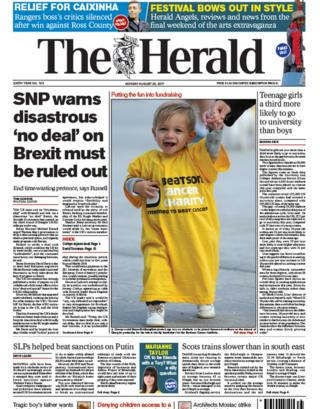 The Herald reports that the Scottish government has warned that the UK must end its "brinkmanship" with Brussels and rule out a "no deal" Brexit. 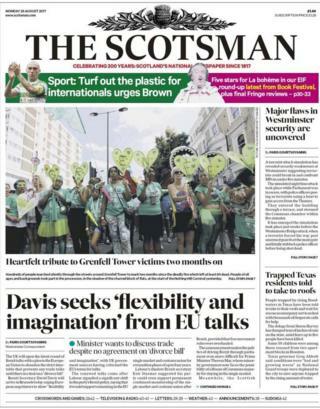 David Davis will urge EU negotiators to show "flexibility and imagination" in talks with the UK, according to The Scotsman. 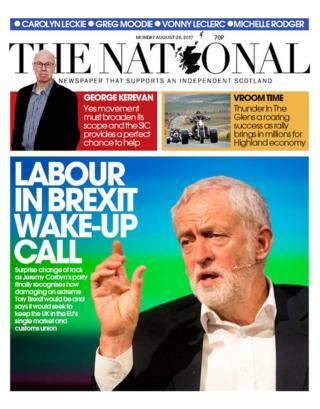 The National says the Labour party "finally recognises how damaging an extreme Tory Brexit would be". It follows a suggestion by Keir Starmer MP that a Labour government could seek to keep the UK in the single market and customs union during an extended transition period. 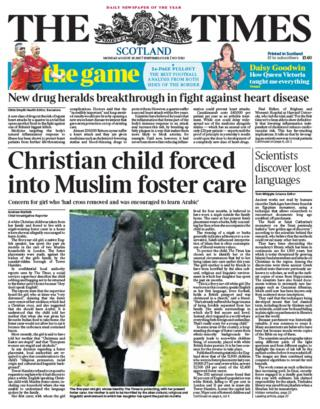 A five-year-old white English girl has been taken from her family and forced to live with a niqab-wearing foster carer, according to The Times. The Scottish Daily Express leads with calls by animal rights activists for tougher sentences for cruelty offences in Scotland. 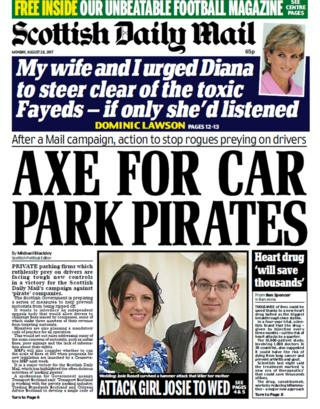 The Scottish Daily Mail is claiming a victory in its campaign against "pirate" private parking firms. It says the Scottish government is preparing a series of measures to help prevent motorists from being ripped off. 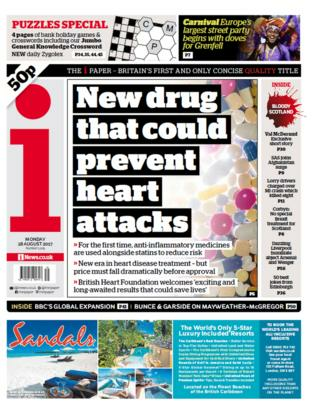 Scientists claim an anti-inflammatory drug could prevent thousands of heart attacks a year, according to The i. 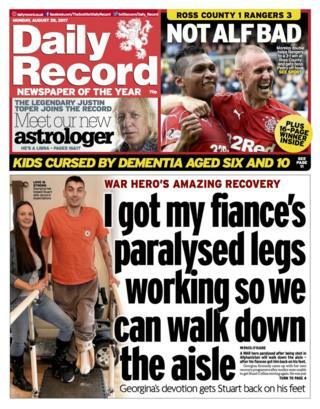 The Record says a Scottish soldier who was paralysed from the waist down is learning to walk again - thanks to a recovery programme drawn up by his fiance. 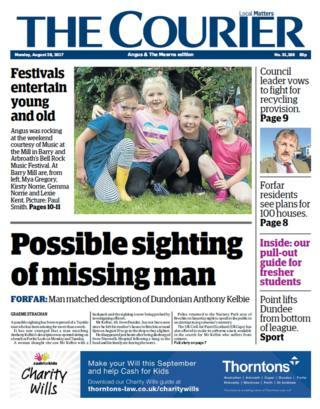 A Tayside man missing for more than a week may have been sighted at Forfar loch, according to The Courier.